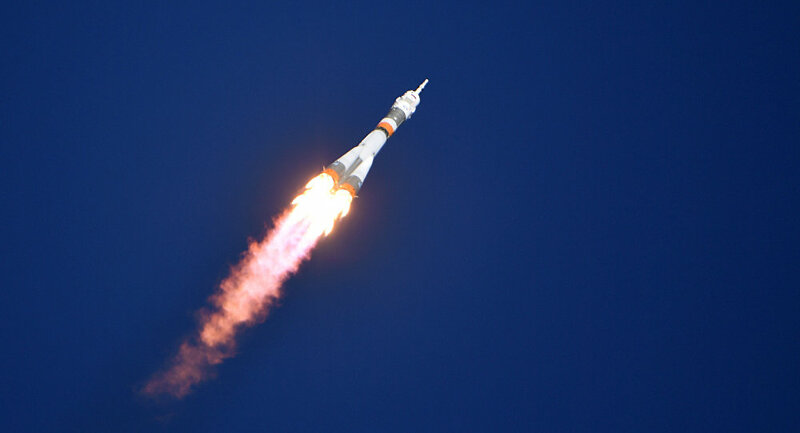 A Soyuz MS-10 spacecraft atop a Soyuz FG rocket manned by a team of two cosmonauts was set to deliver a team to the International Space Station (ISS). All upcoming launches of Soyuz carrier rockets, including from the Vostochny, the Plesetsk and the Kourou launch sites, may be postponed following the Soyuz spacecraft incident on Thursday, a Russian space industry source told Sputnik. "All Soyuz-family carrier rockets use the same systems for separation of the first stage from the second [and that is one of the most probable causes of the accident, according to the source]. Accordingly, all launches are in question," the source said. Until the end of the year, it was planned to conduct three Soyuz launches from Baikonur in Kazakhstan, two launches from Kourou in French Guiana, one from Vostochny and at least one more — from Plesetsk. Chief of Russian state space corporation Roscosmos Dmitry Rogozin has commented on the Soyuz MS-10 emergency landing, saying that the Soyuz crew had landed safely and everyone was alive. "The crew has landed. All are alive," Dmitry Rogozin wrote on Twitter. Russian State Space Corporation Roscosmos chief Dmitry Rogozin has departed for the emergency landing site of the Soyuz crew, Roscosmos said in a statement. Meanwhile, the crew has left Kazakhstan for Moscow. NASA has confirmed earlier in the day that Russian cosmonaut Alexey Ovchinin and NASA astronaut Nick Hague have left a capsule after an emergency landing caused by a booster failure during the Soyuz MS-10 spacecraft launch. "The search and rescue teams have reached the Soyuz spacecraft landing site and report that the two crew members are in good condition and are out of the capsule. Search and rescue teams are with the crew now," the NASA wrote on Twitter. Prior to that, NASA reported that the search and rescue teams were on their way toward the touchdown site of the two Soyuz spacecraft crew members, following a launch accident. "The Soyuz capsule has landed back on Earth carrying two crew members… Search and rescue teams report they are in contact with the Soyuz crew, who report they are in good condition. The teams are en route to the landing site," NASA said on Twitter. The crew of the Soyuz MS-10 spacecraft has landed in Kazakhstan and been in contact, a source told Sputnik previously on the same day, adding that the crew feels "good, as well as possible after experiencing such g-forces." The booster failure occurred during the launch of the Soyuz spacecraft to the ISS with Russian cosmonaut Alexey Ovchinin and NASA astronaut Nick Hague onboard, according to the source speaking to Sputnik. They experienced a g-force of 6gs during the landing, the source noted. According to preliminary data, the Soyuz accident occurred because one of the four first stage units hit the second stage and pressure dropped, the source reported. — Ryan Romeike (@RyanRomeike) 11 октября 2018 г. A Roscosmos commission will carry out an inspection of the rocket space center where the Soyuz FG rocket was produced, according to the source. "A state commission was formed by my decision to determine the cause of the Soyuz-FG carrier rocket accident. It has already begun work. Telemetry is being studied. Rescue services have been working from the first second of the accident. The Soyuz-MS spacecraft emergency rescue system worked properly. The crew was rescued," Rogozin wrote on Twitter. Earlier in the day, the rescue teams reported seeing a parachute descending with the craft, after the emergency on the Soyuz MS-10 spacecraft. The live stream was interrupted several minutes after the launch. The launch of the Soyuz MS-10 spacecraft atop the Soyuz FG rocket manned by a team of two cosmonauts instead of three started at 11:40 a.m. Moscow time (08:40 GMT) on October 11. Due to the heavy load on the current crew of the International Space Station (ISS), the next manned launch may be carried out ahead of time, but only after the investigation of the current Soyuz accident has ended, a source at the Baikonur space center told Sputnik on Thursday. "There will be an attempt to carry out the next launch by mid-November, it will take place ahead of schedule. Three people remain on the ISS, this is ineffective," the source said. Russian cosmonaut Alexey Ovchinin and NASA astronaut Nick Hague, who made an emergency landing after the Soyuz booster failure, will not take part in the next launch to the International Space Station (ISS), a source told Sputnik. The Russian Investigative Committee has stated that it has opened a criminal probe into the Soyuz MS-10 emergency landing, "trying to establish the causes and those responsible for the emergency situation." "Certainly, this incident will require the most thorough investigation involving independent experts, visits to companies, inspections of all technological processes, because the accident happened on a rocket that had very high accident statistics. And this is very bad news," Rogozin stated. He said the good news is that the emergency rescue system worked excellently, and added that Roscosmos evaluated the actions by the Soyuz crew and launch site operators as highly professional. Rogozin said the first meeting of the commission on the Soyuz accident would take place on Thursday at the Baikonur space center.